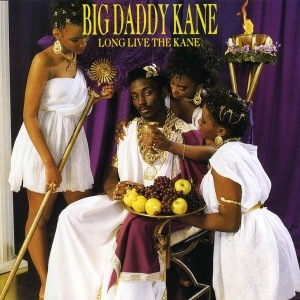 “Long Live the Kane is the debut album by MC Big Daddy Kane, released by Cold Chillin’ Records on June 28, 1988. It was produced by Marley Marl and established both as premier artists during hip hop’s golden age. Kane displayed his unique rapping technique while covering topics including love (“I’ll Take You There”), Afrocentricity (“Word to the Mother(Land)”) and his rapping prowess (“Set It Off”). Marley Marl and Big Daddy Kane display a sparse production style - creating beats with fast-paced drums and lightly utilized James Brown samples. Four singles were released in promotion of Kane’s first album: “Raw/Word to the Mother (Land),” “Ain’t No Half-Steppin’/Get Into It,” “I’ll Take You There/Wrath of Kane” and “Set It Off/Get Into It.” The most commercially successful of these singles were “Ain’t No Half-Steppin’”, which reached #53 on the Hot R&B/Hip-Hop Singles & Tracks chart, and “I’ll Take You There”, which reached #73 on the same chart, but also peaked at #21 on the Hot Rap Singles chart. The other two singles did not chart, but “Raw” and “Set It Off” popularized Big Daddy Kane’s high-speed style and abundant use of word play. “Raw” and “Ain’t No Half Steppin’” are both described as “underground sensation[s]” and “classic[s]” by Allmusic’s Steve Huey. “Raw” does not appear on Long Live the Kane, but a remix which utilizes the same beat does. - The album comes in at #6 on Ego Trip’s Top 25 Rap Albums of 1988. - The single ‘Ain’t No Half Steppin’’ comes in at #3 on Ego Trip’s Top 40 Rap Singles of 1988.